From my “hippie” days, I well remember the heyday of rock legend Bob Dylan (birth name Robert Zimmerman). His hit song “The Times They Are A-Changin” appeared in 1964. I had started listening to rock music in the early 1960s and was consumed with it until I was saved in 1973. 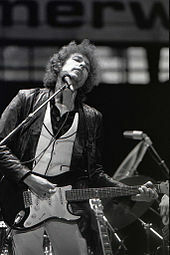 Dylan, who was included on Time magazine’s list 100 most important people of the twentieth century, helped to popularize the merging of folk and rock music. He was one of the chief poets of the ’60s generation. His songs posed many questions, but he had no answers. In “Blowing in the Wind,” he asked such things as, “How many roads must a man walk down before he is called a man?” What is the answer? “The answer, my friends, is blowing in the wind...” This means that he doesn’t know the answer and he is not sure anyone knows the answer. Sadly, that is the philosophy of most of Dylan’s fans because they have rejected the Bible as the Word of God. Dylan’s backup group, known simply as the Band, was formerly called Ronnie Hawkins and the Hawks. They “had a reputation for pill popping, whoring, and brawling that was second to none” (Robert Palmer, Rock & Roll an Unruly History, p. 3). The cover to Dylan’s Desire album (1976) depicts him smoking marijuana in one corner, a black magic tarot card in another corner, and a huge Buddha in a bottom corner. Next to Buddha are the words: “I have a brother or two and a whole lot of Karma to burn … Isis and the moon shine on me” (Muncy, The Role of Rock, p. 167). Isis, of course, is an ancient goddess. In 1977, Dylan divorced Sara Lowndes, his wife of 12 years and the mother of his four children. In 1986, he married his backup singer Carolyn Dennis after they had a child out of wedlock. They divorced in 1992. In 1978, Dylan attended a home Bible study with girlfriend Mary Alice. She had “re-dedicated her life to Christ” and was concerned that she was living with an unsaved man who was not her husband. She invited two assistant pastors from the Hollywood Vineyard Church (associated with the Vineyard Christian Fellowship under the leadership of the late John Wimber) to visit Dylan’s home. Dylan’s testimony was as follows: “One thing led to another ... until I had this feeling, this vision and feeling. I truly had a born-again experience, if you want to call it that. It’s an over-used term, but it’s something that people can relate to” (Steve Turner, Hungry for Heaven, p. 160, citing a November 1980 interview with Robert Hillburn of the Los Angeles Times). From this testimony, we can see the influence of Vineyard theology, which focuses on experiential feelings, visions, voices, personal prophecies, healing, tongues, and such things. This was particularly true during the heyday of John Wimber’s influence. (See “John Wimber” in the Directory of Contemporary Christian Worship Musicians, available as a free eBook from www.wayoflife.org.) The experience-oriented theology does not produce stability in the Christian life. Dylan spent three and a half months at the Vineyard church’s School of Discipleship, and his next three albums, Slow Train Coming (1979), Saved (1980), and Shot of Love (1981), were gospel albums of sorts. Dylan did not attend church regularly and soon quit altogether. By the early 1980s, he repudiated his claim to the Christian faith and returned to his eclectic religious faith and rock & roll lifestyle. In 1984, Dylan told Kurt Loder of Rolling Stone magazine: “I’ve never said I’m born again. That’s just a media term. I don’t think I’ve been an agnostic. I’ve always thought there’s a superior power, that this is not the real world and that there’s a world to come” (Rolling Stone, June 21, 1984; reprinted in Dylan on Dylan: The Essential Interviews, p. 288). “Here’s the thing with me and the religious thing. This is the flat-out truth: I find the religiosity and philosophy in the music. I don't find it anywhere else. Songs like ‘Let Me Rest on a Peaceful Mountain’ or ‘I Saw the Light’--that’s my religion. I don’t adhere to rabbis, preachers, evangelists, all of that. I’ve learned more from the songs than I’ve learned from any of this kind of entity. The songs are my lexicon. I believe the songs” (David Gates, “Dylan Revisited,” Newsweek, October 6, 1997). Even rock historian Steve Turner, who has attempted to justify Dylan’s apostasy, admits: “The womanizing and drunkenness that Dylan once saw as evidence of the old life have apparently continued almost uninterrupted” (Turner, “Watered Down Love,” Christianity Today, May 21, 2001). Dylan has dabbled in Lubavitch Hasidism, an ultra-orthodox form of Judaism, suggesting that he was exploring his Jewish roots. “Bob Dylan, the Midwestern Jew who drifted away from Judaism while pursuing his career as singer and songwriter, appeared at synagogue prayers on the Yom Kippur Day of Atonement and was honored with a call to the reading of the Torah, according to Shmais.com. He attended the Chabad synagogue of Beth Tfiloh in Atlanta, Georgia. The crowd of 900 other worshippers quickly identified the 66-year-old Dylan, whose original name is Robert Zimmerman. He was called to the sixth of seven parts of the Torah reading and remained for the sermon and the memorial service of Yizkor” (“Day of Atonement Draws Dylan to the Torah,” Arutz Sheva, Israel National News, Sept. 24, 2007). “Billy Graham was the greatest preacher and evangelist of my time--that guy could save souls and did. I went to two or three of his rallies in the ’50s or ’60s. This guy was like rock ’n’ roll personified--volatile, explosive. He had the hair, the tone, the elocution--when he spoke, he brought the storm down. Clouds parted. Souls got saved, sometimes 30- or 40,000 of them. If you ever went to a Billy Graham rally back then, you were changed forever. There’s never been a preacher like him. He could fill football stadiums before anybody. ... Long before Mick Jagger sang his first note or Bruce strapped on his first guitar--that’s some of the part of rock ’n’ roll that I retained. I had to. I saw Billy Graham in the flesh and heard him loud and clear” (“Looking Deeper into Dylan,” AARP the magazine, Feb.-Mar. 2015). This is a strange statement. Dylan was changed forever in the 1950s and 1960s by Graham’s preaching? Dylan, the drug user who taught the 1960s generation that there are no answers to life’s mysteries (e.g., “Blowin’ in the Wind”), who included Tarot cards and Buddhas on his album covers, who made a profession of faith in Christ in the 1980s only to repudiate it? Actually, Bob Dylan well represents a large percentage of Billy Graham’s converts. Multitudes of people professed faith in Christ, but biblical evidence of the new birth was rare. Graham helped Christianize America, but it was a house built on sand. In an interview with Ed Bradley, aired on 60 Minutes, June 26, 2005, the 63-year-old rock singer said that his early songs were “almost magically written … kind of a penetrating magic.” He also said that he made a bargain with the devil. Question: Why do you still do it? Why are you still out here? Dylan: It goes back to that destiny thing. I made a bargain with it a long time ago, and I’m holding up my end. Q: What was your bargain? Dylan: To get where I am now. Q: Should I ask whom you made the bargain with? Dylan: With the chief commander. Dylan: (laughing) On this earth and the world we can’t see. This refers to the old blues concept of selling one’s soul to the devil, something that Robert Johnson and others have sung about. A bargain with the devil would explain Dylan’s strange life.